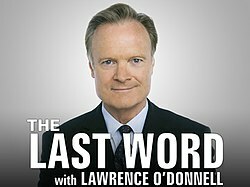 The Last Word with Lawrence O'Donnell is an hour-long weeknight news and political commentary program on MSNBC. The program airs live at 10:00 P.M. Eastern Time Monday-Thursday, and is hosted by Lawrence O'Donnell. O'Donnell is described by MSNBC as "providing the last word on the biggest issues and most compelling stories of the day." The show originally premiered in the 10pm slot Monday-Thursday on September 27, 2010, with the first episode featuring Vice President Joe Biden and Countdown host Keith Olbermann. The show was moved to the 8pm slot in January 2011 when Olbermann's show was canceled. Last Word returned to its original 10pm slot in October 2011. Guest hosts for the series include Ezra Klein, Steve Kornacki and Ari Melber. Michael Steele, Chairman of the Republican National Committee, appeared on October 5, 2010. Howard Dean, former Chairman of the Democratic National Committee and former Governor of Vermont, appeared October 5, 2010. Ron Paul, former Republican Congressman of Texas's 14th congressional district, appeared October 11, 2010. Valerie Plame, former CIA operative, and husband Joe Wilson appeared on October 19, 2010. ^ Schwartz, Carly (2011-01-21). "Final Countdown: Keith Olbermann And MSNBC Announce They Are Parting Ways (VIDEO)". Huffington Post. ^ Gellman, Lindsay (2010-07-31). "'Last Word': Lawrence O'Donnell MSNBC Show Gets Name". The Huffington Post. Retrieved 2010-08-09. ^ Stelter, Brian (June 15, 2010). "Lawrence O'Donnell Gets His Own MSNBC Show". New York Times. Retrieved August 26, 2016. ^ O'Donnell, Lawrence (2010-09-23). "'Vice President Joe Biden to Appear on Premiere". Twitter. Retrieved 2010-09-29. ^ "MSNBC changes primetime lineup". 2011-10-20. Retrieved 2011-11-05. ^ a b O'Donnell, Lawrence (2010-09-28). "'Charlie Crist and Levi Johnston to appear on tonight's show". Twitter. Retrieved 2010-09-29. ^ a b O'Donnell, Lawrence (2010-10-04). "Michael Steele and Howard Dean both join us tomorrow night". Twitter. Retrieved 2010-10-05.